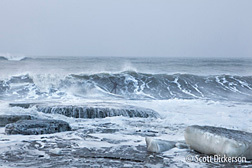 Caught between two intense passions I aim to strike a balance. 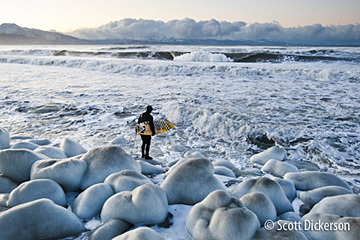 Sometimes to surf is not to photograph, and to photograph is not to surf. 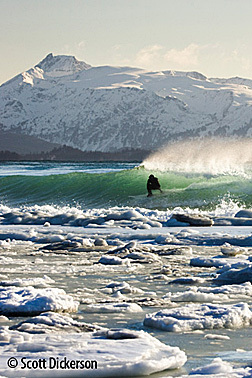 When the scenery is less than mind numbing majestic the camera is easily left behind, however surfing in my homeland of Alaska rarely leaves me with such an easy out. 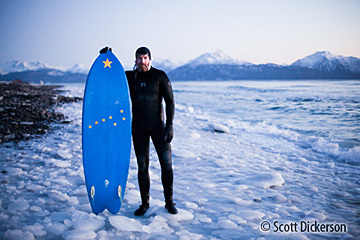 Looking at photos of surf culture in other parts of the world I can just begin to appreciate the uniqueness of my relationship with the ocean and it's environment here in Alaska. 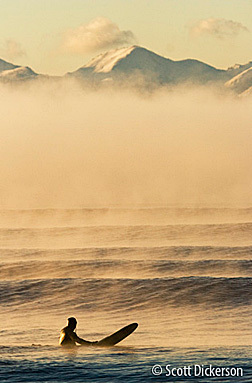 Surfing and photography for me are pursued either alone or with no more than a handful of friends. 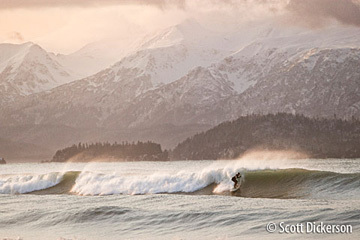 The waves are of paramount importance no doubt, but often the most memorable part of a session will be something else- the way the mountains and glaciers glowed in the pink and blue light of a winter sunset, or how the last high tide receded leaving the rocks covered in 6 inches of ice. 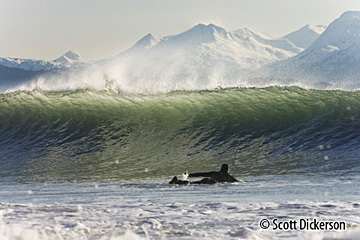 When photographing surfing I strive to capture more of the whole experience in which the act of riding the wave is one part. 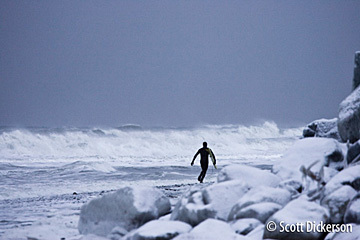 I live in my hometown of Homer, Alaska and am a full-time professional photographer (www.scottdickerson.com) and also publish a blog about surfing in Alaska (www.surfalaska.net).